Fish and chips are undoubtedly a favourite British takeaway. But why not make them yourself using haddock or pollack, as an alternative to cod? Make the batter by sifting the flour into a large bowl and seasoning. Make a well in the centre and gradually whisk in the egg yolk and beer using a balloon whisk to form a smooth batter. Stir in the water. Keep in the fridge until ready to use. Heat the oil in a deep fat fryer or a pan with a basket, to 180-190°C (see Cook’s tips). If you prefer, use a heavy-based saucepan, fill to about one third full and use a slotted spoon instead of a basket. Just before cooking the fish, whisk the egg white until stiff peaks form, and fold into the batter using a metal spoon. Dust the fish fillets with a little flour, then dip each piece in the batter to coat well. Carefully add 2 of the battered fish fillets to the hot oil and fry for 5-6 minutes, until golden. Remove with a slotted spoon, drain on kitchen paper and keep warm in a low oven, about 140°C, gas mark 1. Repeat with the remaining fish. 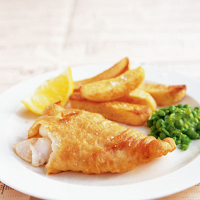 Serve the fish with homemade or oven chips and crushed or puréed peas, and lemon wedges. If you don't have a thermometer, drop a spoonful of batter into the oil first. If it browns and bubbles furiously after 30 seconds, the oil is ready. Fish and chips deserve a traditional beer such as Fuller’s London Pride Premium Ale, which has a distinctive malty base, complemented by well-developed hop flavours.